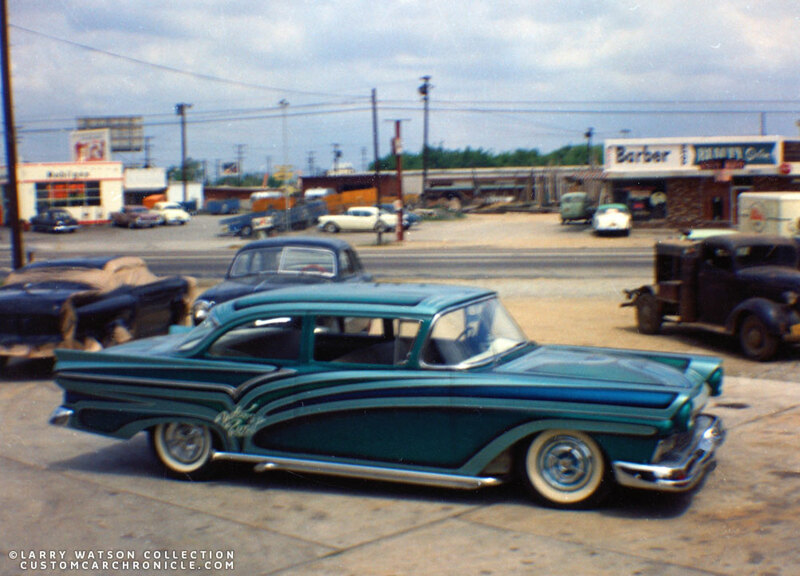 The 1957 Ford was a popular base for mild Customs, they did not need much to look really great. 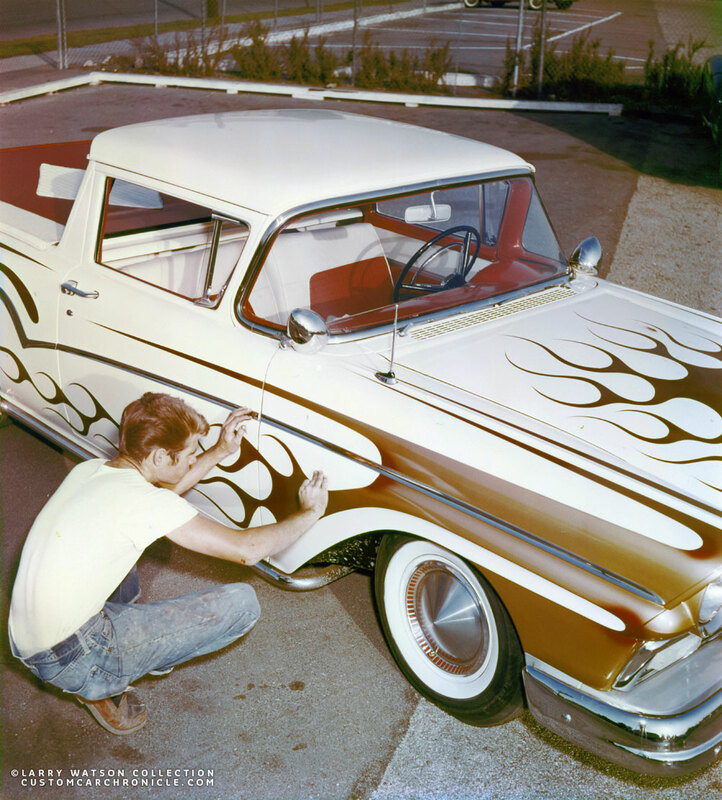 Larry Watson painted several of them, from mile two tone paint jobs to wild panel, outline and flamed versions. 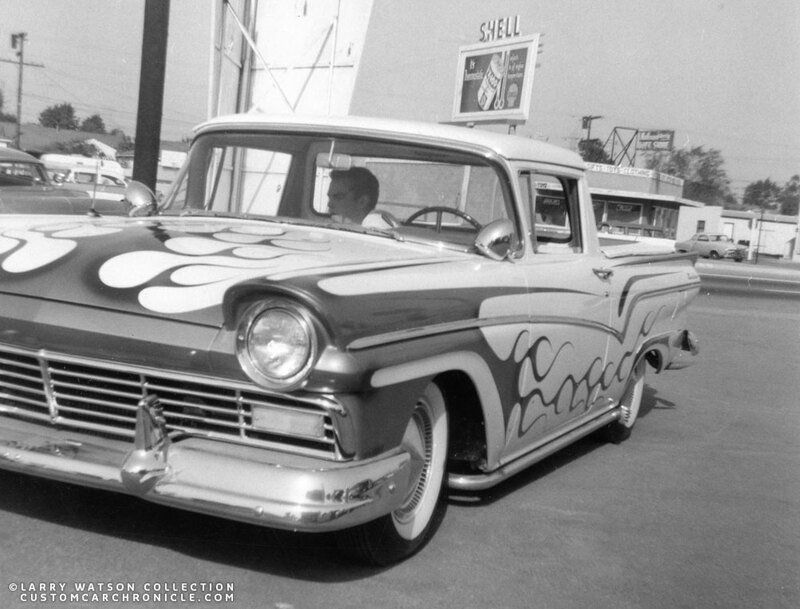 This article shows a selection of photos of 1957 Fords painted by Larry Watson. All of these photos come from the Larry Watson Personal Photo Collection. More on Larry’s personal collection can be found in the Larry Watson section on the CCC-Site. Or on the Custom Car Photo Archive. Special thanks to Roger O’Dell for scanning this amazing material and sharing them with us on the Custom Car Chronicle. When the 1957 Ford was introduced in late 1956 the Custom Car scene has chanced drastically from the early 1950’s scene. 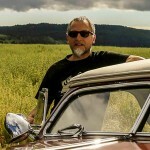 The panoramic windows made it much harder to chop a car, so more and more milder Customs made up the scene. Cars that only had minimal body changes, lowered suspensions and wonderful paint-jobs started to dominated the shows and streets. The 1957 Ford was already a good looking car from the factory. Wonderful panoramic windshield and rear window. Beautiful side trim that started at the hooded headlights flowing nicely to the rear with a gentle downwards movement following the line of the roof. Then kicking up at the rear quarter to enhance the rear fender fin. These cars needed very little to look even better. The car looked extremely great with a lowered suspension with a nice mild forward rake, mild de chroming and of course a good looking pearl or candy paint job. 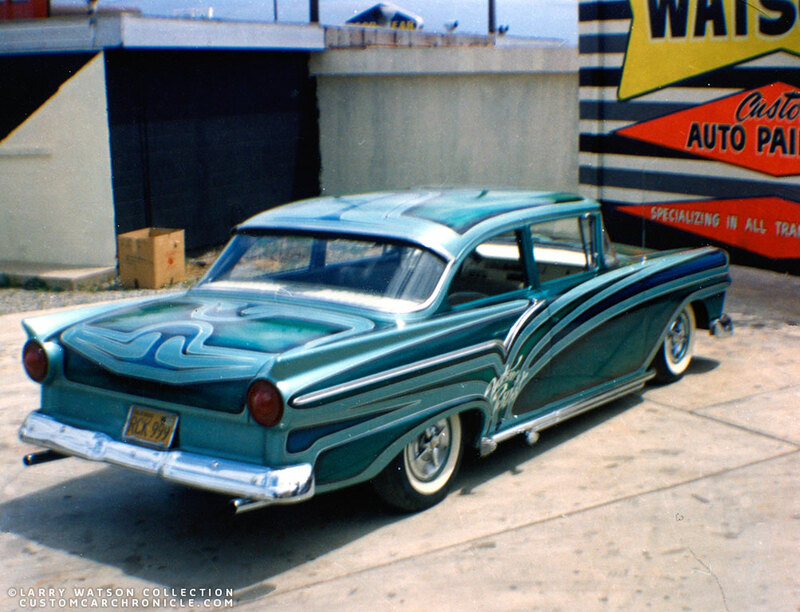 Larry of course knew the best ways to make these 1957 Ford bodies look even better using his paint and design skills. 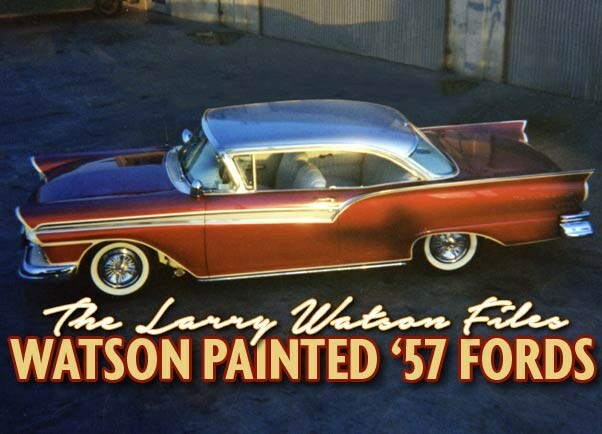 Lets take a closer look at some of the 1957 Fords Larry Watson painted in his career. This 1957 Ford Sedan was mildly customized with its door-handles and emblems removed. Larry painted the car is a light green-blue pearl base. The Larry designed an wild combination of outlines, panels and scallops to highlight the body contours. These were painted in bright candy dark blue and turquoise, both with fogged darker edges and outlined with a heavy white pinstripe. The car is on a slight forward rake, has double dummy lake pipes, and color coordinated four bar lancer hubcaps. 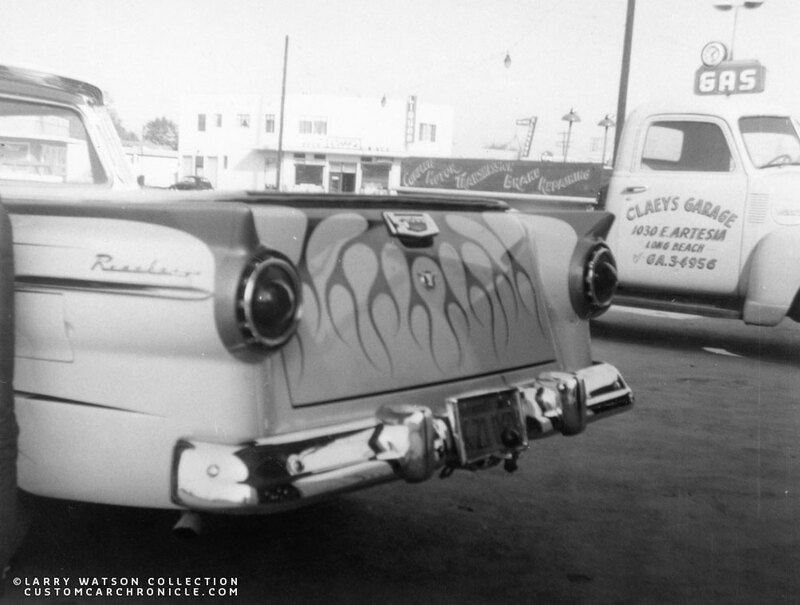 The rear 3/4 photo taken at Larry’s Rosecrans Blvd shop in 1960 shows that the also had a name painted on the rear quarter. Sadly both photos of the car from Larry’s Collection are a bit blurry and prevent for reading the name. The photos did not have any info, so we also do not know who owned this car, not what happened to it. Sadly there are no individual photos of this wonderful deep candy red and dark champagne outlined 1957 Ford Hard-Top. 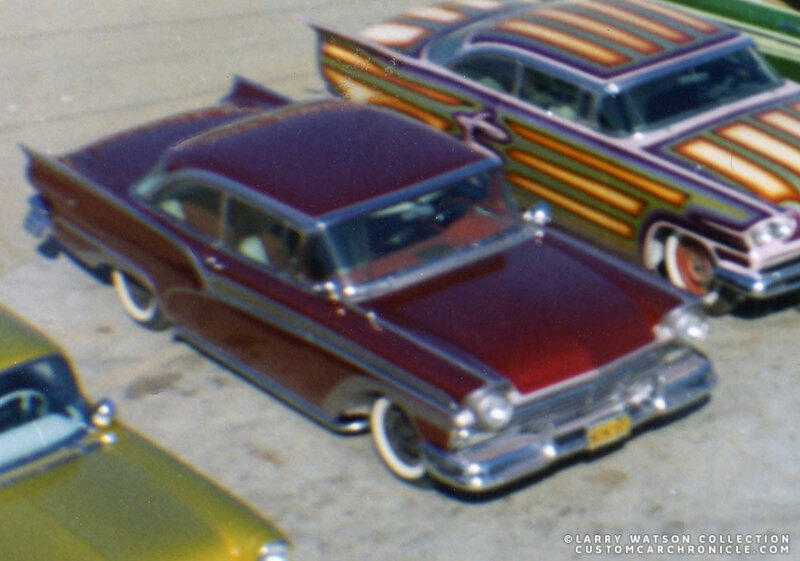 It only appears in a few overview photos of a number of colorful cars parked at Larry’s Rosecrans Blvd shop in 1960. The lack of having hubcaps indicated the car was freshly painted and still needed final assembly. The outline design accentuates the lines of the car, and makes it look longer and lower. The Rosecrans Blvd shop where Larry was from 1959 to 1960 was Larry’s most prolific shop. Here he created a huge number of wildly painted cars as this photo clearly shows. The Candy red and dark champagne colors on the 1957 Ford much have looked stunning in person. This photo was taken at an late afternoon at the Rosecrans Blvd shop. Its show an mild custom 1957 Plymouth and another candy red painted 1957 Ford that Larry painted. 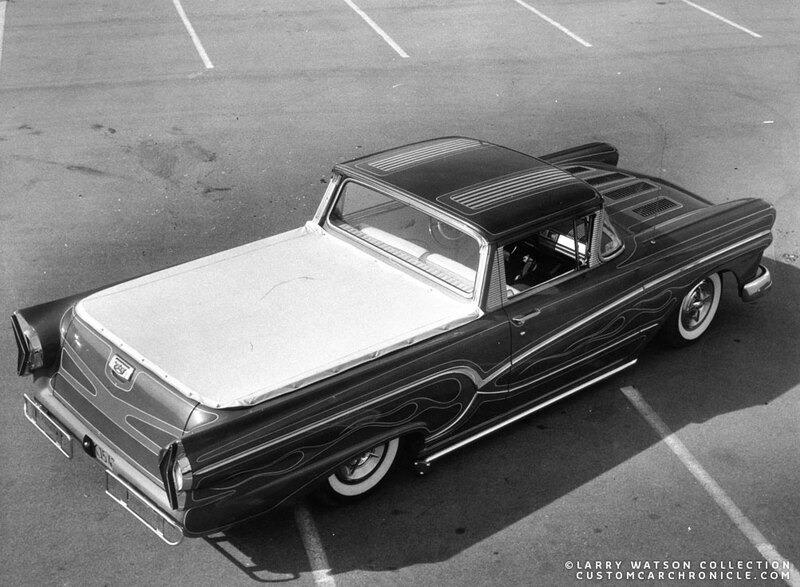 This 1957 Ford is my personal favorite Larry Watson did, sadly this is the only photo the car is shown in full. Larry also used outlines on this mildly shaved car, but much more refined than the previous one I showed. It appears the outline was done in pearl white, and Larry painted the top in a fine silver. 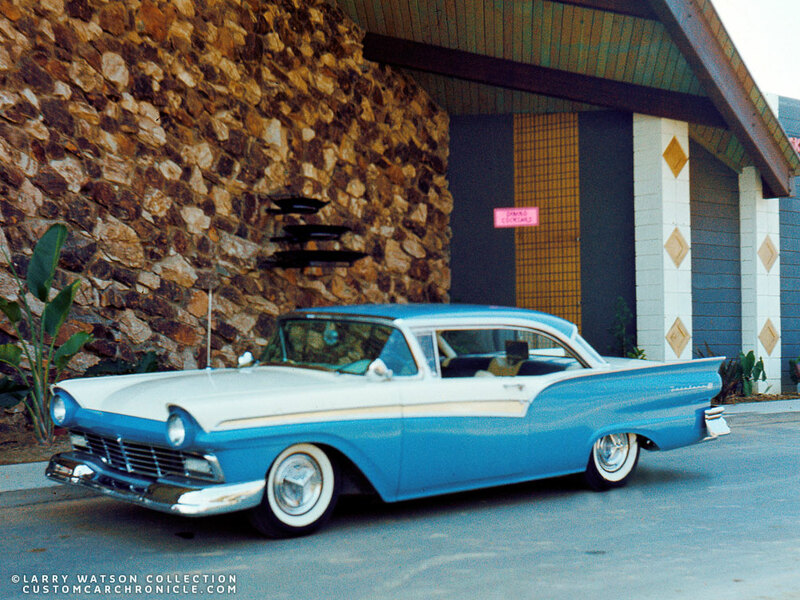 The car has the perfect stance, customized hubcaps, spotlights and lake pipes to create the perfect 1957 Ford. This photo shows that Larry started to use single colors in late 1960’s. Larry loved to do the more intricate flames, panels, outlines and two tones. But also realized that single colors looked great, the customers loved them and he could do them much faster, being able to paint many more cars that was. This pearl off white Hard-Top looks like it was fleshly pained and ready to be picked up by another happy customer. 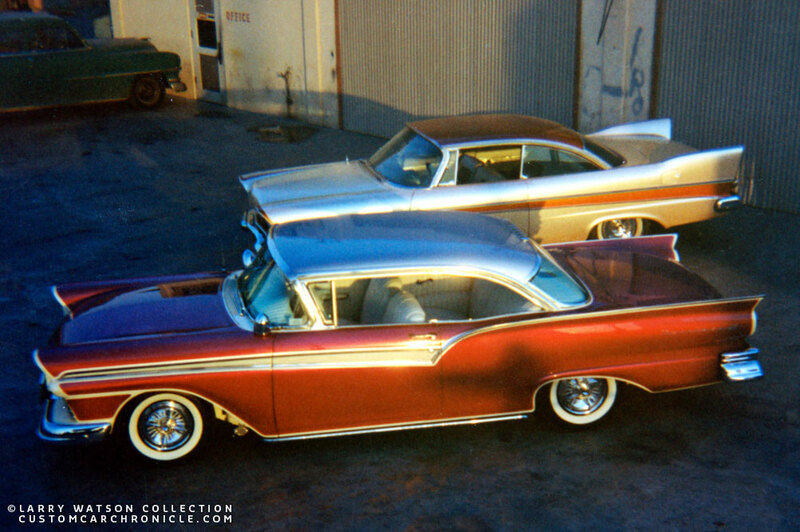 This photo shows how little these 1957 Fords need to look good. Some emblem removal, lowered suspension with a slight forward rake, three bar spinner hubcaps and a Larry Watson blue and white paint-job. 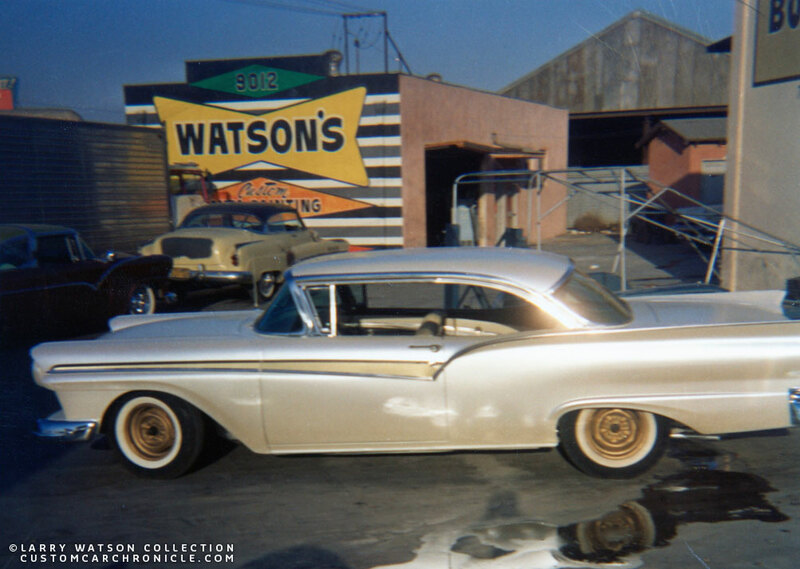 The Watson Collection only has this one photo of the car, with no additional info on the owner. 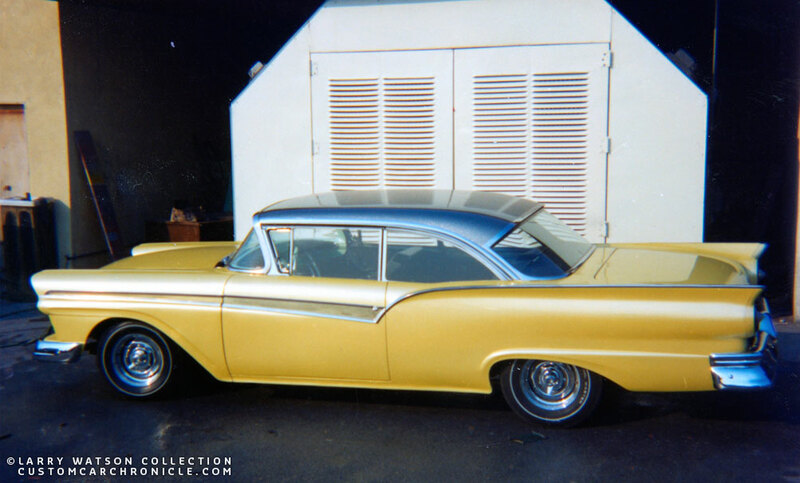 A little later Larry painted this 1957 Ford Hard-Top in a wonderful pearl banana yellow and a metallic silver top. The body was shaved and the suspension lowered with a slight forward rake. The car has chrome reversed rims and ultra thin white wall tires giving the car a much differnt look than the wider white walls popular in previous years. Larry also painted several 1957 Ford Ranchero’s. These pick up versions of the 1957 Ford were very popular. 1957 was the first year of the Ranchero and fro the beginning they were often used use mild custom. Larry did two of these that had quite a bit publicity. One for Nick DeMattie in candy root beer, silver and flames, and the other for George Mitobe in green with outlines and flames. On both these Ranchero’s we will do a full feature article in the near future. 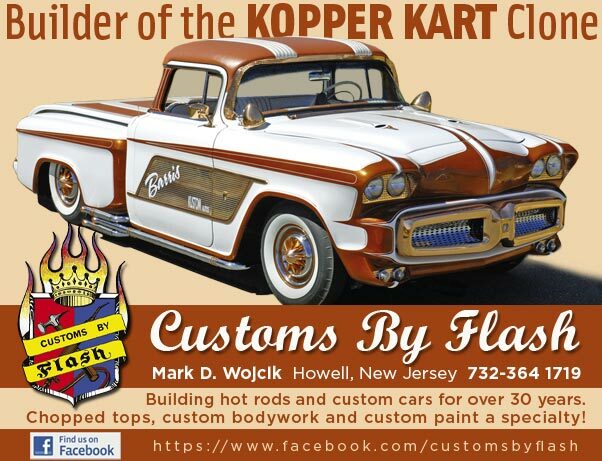 Jim Griepsma (from Dutch origins) owned this white and flamed 1957 Ranchero. 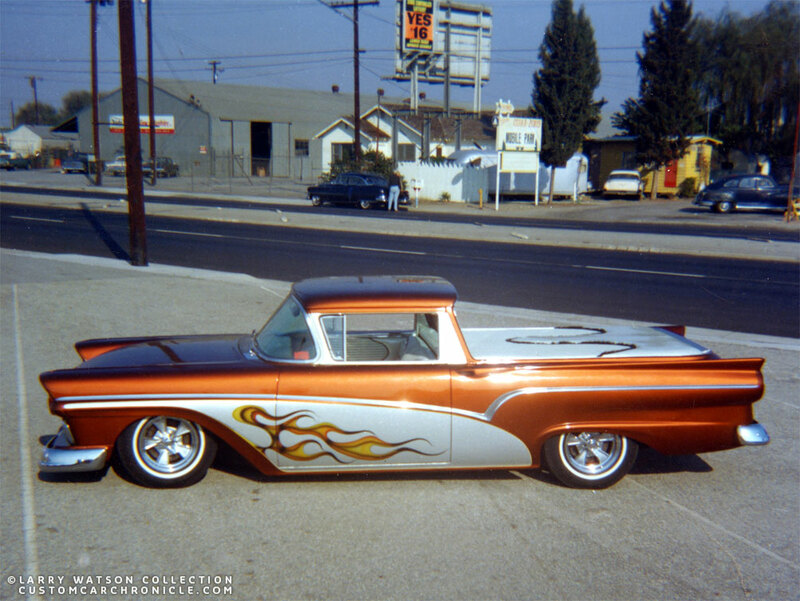 This is possibly the first 1957 Ford Ranchero Larry painted. He did the work when he was at his 1016 E Artesia Shop in North Long Beach. The car was white when it came from the factory. Some emblems were shaved from the front and the body work was covered when Larry applied the flames in gold and red accents. This photo was a staged scene showing Larry faking how he striped the flames. That is possibly Jim inside the car parked in front of the E Artesia shop. Larry combined flames with scallops on this car. The car showing on the far left, just above the hood is the Moonglow. Jim’s Ranchero used, as most of the ’57 Fords in this article a stock grille. Jim used 1957 Plymouth hubcaps and added a set of full length lake pipes. This photo of the rear shows more flames on the tailgate and also shows that the rear quarter script as well as the tailgate had not been shaved. This rear 3/4 view shows Jim’s Ranchero had a nice forward rake. The Moonglow in silver and white scallops can be seen on the far left side of the photo. George Mitobe owned this wonderful candy green and gold Ranchero. Larry designed a wonderful combination of outlines and flames for the car. Interesting is that George decided to lower the car with a level stance, unlike most other 57 Ford which were lowered more in the front. Lake pipes made it look even lower, and the four bar lancer hubcaps on wide white wall tires are absolutely perfect for this car. The rear of the car featured the most customizing. 1958 Edsel taillights were used and the rear bumper was replaced by a molded in roll pan and nerf-bar bumper. This bird-eye view also shows the paneled sections on the roof with the chrome tape, a very popular custom technique from the late 1950’s. 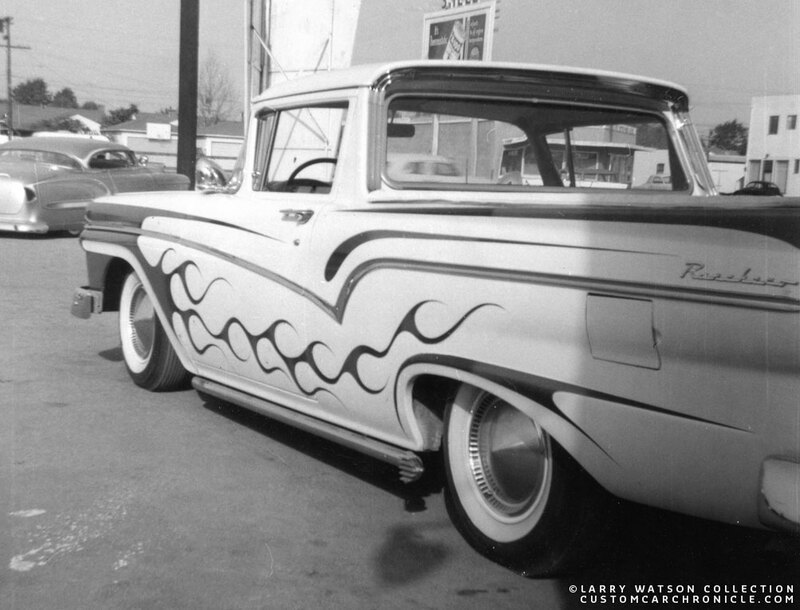 Larry painted Nick De Mattie’s 1957 Ranchero in the mid 1960’s. The car was painted in a brilliant fine silver with candy root beer, and free style airbrushed flames. The silver panel flows beautifully with the side trim and has a bit of a 1953 Buick feel to it. It helps optically makes the car look longer. The body work on the car was done by Art Chrome’s shop. The wild interior was done in a wild pearl tuck&roll by Joe Perez. In the first photos showing the wild scallops, Fogging, Outlining, Are just sweet paint jobs Larry did. The use of his color combination’s are just a hint of how Larry saw cars and what they could look like. I like to think Larry when he done his paint jobs kind of used his customer’s cars as his own personal canvas trying new things all the time. I often wonder if many of the young guys who got there cars painted really got what they intended to get from the start, Or if Larry talked them into paint jobs they did not intend to get so he could set new boundaries’ witch in turn made these wild combination’s FADS…? This is one of the questions I regret asking Larry while he was still alive.